This is a followon from a previous post on bitcoin, except this one covers dogecoin, the hilarious new cryptocurrency invented out of thin air by Jackson Palmer in the good ol’ AU of S.
I was going to check out Max-Coin, which was created by a former part-time stock broker over in America somewhere, but there seemed to be a lot more resources around on creating Dogecoins, so here’s yet another howto on getting that up and running. It’s essentially the same steps as for bitcoin, but it appears that a lot of the dogecoin mining pools are dead, so expect to have to try a few before finding one that works. Software-wise, you’ll need a wallet and some mining software, as was the case for bitcoin. And then copy your address somewhere, since you’ll be needing it later. 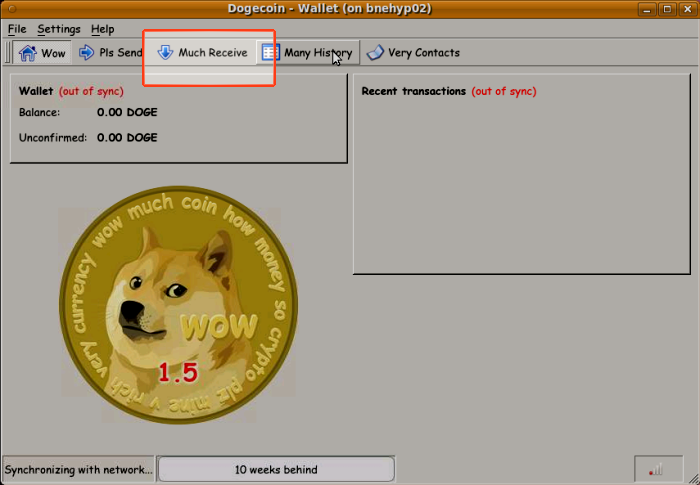 The mining software I’m using for dogecoin is called cgminer. Since I was intending to use my GPU to mine for coins, I couldn’t install it on the same Ubuntu 10.04.4 LTS (Lucid) machine as my bitcoin setup, as some of the required packages aren’t available, so I’ve installed it on 12.04.4 LTS (Precise) instead. 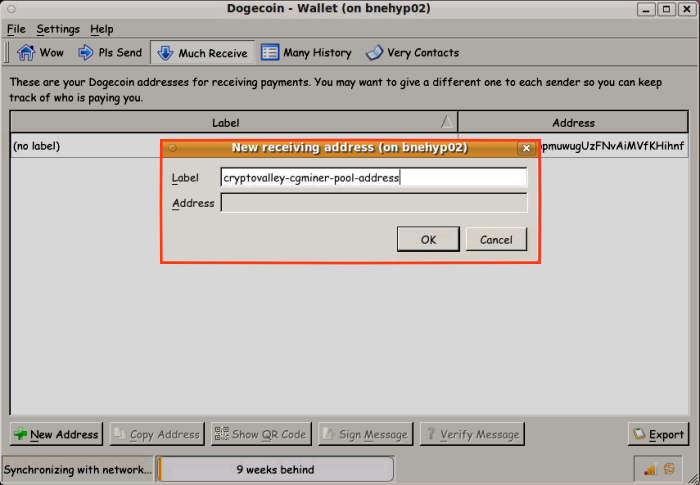 So cryptovalley seems to be the pool that everyone’s using ( http://doge.cryptovalley.com), but at the time of writing (17/2/14), their signup process was broken (usernames could be registered, but couldn’t then be used to log on to their site). This facebook page seems to indicate that a lot of other people are seeing similar issues. Unlike the Eligius bitcoin mining pool, this one requires a username/password, and a PIN. The registration page of http://doge.pool.pm . I’ve noticed that a lot of these pools seem to be running the same server software. 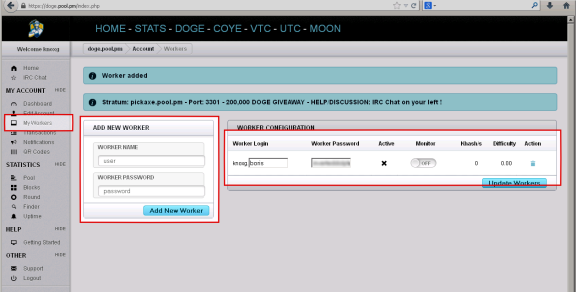 Once you’ve signed up, you’ll need to create a ‘worker’ with it’s own username and password, which is what cgminer uses to submit work into the pool. Now you’re able to submit work into the pool. The cgminer miner is started using the server details on the pool website, together with the username of your worker (which for this pool is appended to my account username) and the password you created with it. I think the statistic that I’m supposed to be interested in is the Work Utility (“WU“) values highlighted above, define as the “number of diff1 equivalent shares / minute”. I imagine this somehow translates into the number of dogecoins shared by the pool when a new block is discovered. 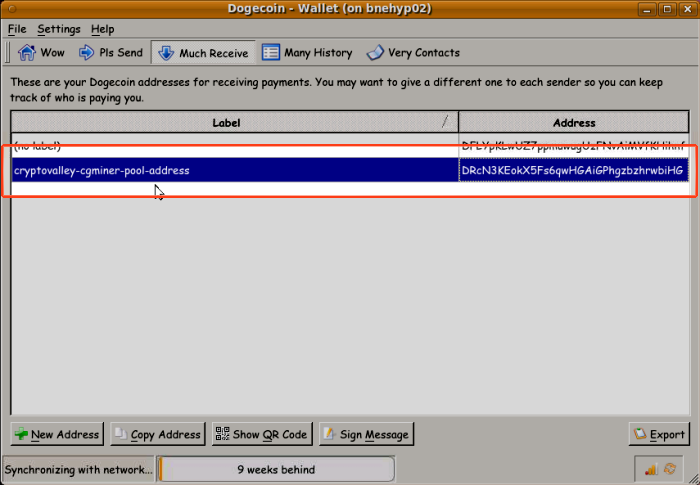 Postscript: Just another note, once I got everything running, the doge.pool.pm website started 504ing (with Gateway Timeout errors), so that pool may not have long to live either.